Shaoil mi gum fheuchamaid rudeigin ùr. I thought that we would try something new. Luchdaich suas dealbh an seo gun ghabh sibh is innse dhuinn sgeul ghoirid mu dheidhinn e.
Upload a photograph here that you took and tell us a short story about it. beanntan, anns a' Ghàidhealtachd leis na càirdean againn. Aona Latha, chaidh sinn do Gleann Sìth. Dh'iarr sinn An Sochach a streap. One day, we went to Glen Shee. We wanted to climb An Sochach. Bha i latha fuar sa Mhàrt. Cha robh e ro dhoirbh, agus ràinig sinn air muin na beinne ann an trì uairean. It was a cold day in March. It wasn't too difficult and we reached the top of the mountain within three hours. Nuair a choisich sinn sìos na beinne, thoisich stoirm-shneachda. Nuair a sguir e, ghabh mi an dealbh seo. When it stopped, I took this photograph. Full of mistakes, I'm sure! Last edited by sr3nitygirl on Fri Jul 20, 2012 10:32 am, edited 2 times in total. Glè mhath! Tha an dealbh seo bòidheach agus tha an sgeul inntinneach gu dearbh. Very well! The picture is nice and the story is really interesting. ...gun gabh is gun innis sibh -- ? Dh'iarr sinn streap air An t-Sochach. Nuair a bha sinn a' coiseachd sìos bhon bheinn -- ? Shaoil indeed... That was dumb of me. Àlainn! Nach e sin na smuaintean! Bha an dealbh seo air a dhèanamh nuair a bha m’ athair ag obair ann an Afraga (ann am Mali), o chionn ceithir no còig bliadhna. This photo’s made when my father was working in Africa (Mali), four or five years ago. ’S e còmhnard mòr a tha ann agus tha an rathad seo glè chòmhnard ’s glè dhìreach mar as urrainn dhuibh faicinn san dealbh. It’s a large plain there and the road is very plain and very straight, as you can see at the picture. Seallaibh, tha rudegin mar togalach mòr fad às an-seo air ur beulaibh; ach chan e togalach no tùr sam bith a tha ann idir. Look, there’s something like a large building or tower far off here before you; but it is neither building nor tower at all. Seo cruachan nàdarra san fhìrinn. Rinn a’ bhleith fuirm a’ chruachain seo. It’s a natural conical hill really. The weathering made the form of this hill. B’ àbhaist do m’ athair agus cuideigin eile siubhal air an rathad seo gu tric dhan àite far a bha iad ag obrachadh. My father and some other people used to travel often by this road to the place where they worked. Chan ann mòran nithean a tha ri gach taobh an rathaid; chan ann tric a tha càr sam bidh a’ nochdadh air, agus tha e coltach nach faod rudegin dragh a chur air draibhear an-seo. Not many things there are on each side of the road; not often there does any car appear, and it seems that nothing can trouble a driver here. Ach ’s ann an-seo a chaidh m’ athair agus na caraidean aige air tubaist-rathaid! But it’s here that my father and his friends had an road accident! Thuit an draibhear aca na chadal, agus chaidh an càr aca às an rathad, dìreach chun an stoic (colbh? – road post) no rudeigin mar seo. Their driver fell asleep, and their car went off the road, directly at the road post or something of the like. Gu fortanach, ged a chaidh m’ athair a ghoirteachadh, ach cha robh fada gus an robh e ann an deagh shlàinte a-rithist. Fortunately, though my father was hurt, soon he was at good health again. Rinn thu glè mhath! Tha mi toilichte gun do thill sibh slàn sàbhailte ged a bha stoirm ann. Seo a' chad fhear agam = Here's my first one. Bha sinn airson An Sochach a shreap. Dh'iarr sinn = you are asking/wanting something of somebody. Depending on dialect, you do pronounce "sreap" as "streap", but don't write the t, because it lenites. 'S e latha fuar sa Mhàrt a bh' ann. far a bha iad ag obair. "obrachadh" means "working" in the sense of "not broken". Sinc'e you've got "b' àbhaist..." you might want "far a bhiodh iad ag obair"
chan ann tric a nochdas càr sam bidh air, - the othher sentence wasn't wrong as such, but this fits the sense better. You could use "fulang" with "tubaist-rathaid"
Bha mi ann an Ìle còmhla ri caraid as t-samhradh. I was in Islay with a friend. Chaidh sinn a Dhiùra fad latha. We went to Jura for a day. Rinn sinn beagan coiseachd agus chunnaic sinn fèidh. Bha barrachd dhiubh ann nas fhaisge air an t-sliabh. 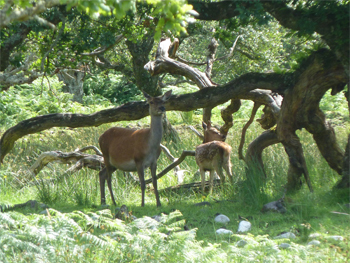 We did a bit of walking and we saw some deer. There were more of them closer to the hillside. Ged a thog mi an dealbh seo fais air allt, cha robh duilgheadasan againn leis a' mheanbh-chuileag. Although I took this picture close to a stream, we didn't have any trouble with the midges. Bha mi ann Caolas Chatham ann Alaska mar ri an long Fairweather. 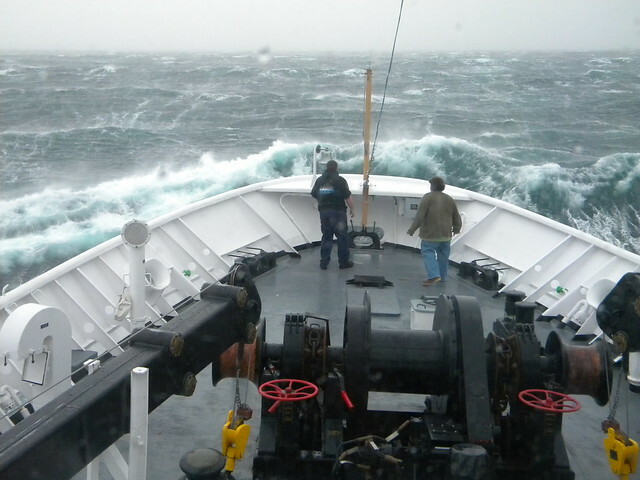 I was in Chatham Strait in Alaska with the ship Fairweather. Bha sinn ag oibreachadh pròiseact suirbhidh. We were working a survey project. Cheap an cuairt-ghaoithe i sinn ann an caolas. Bha sinn fasgach ann an caolas ach bha an muir iad coig deug troigh air àirde fhathast. A cyclone caught us in the strait. We were sheltered in the strait but the seas were still fifteen feet in height. Thionndadh sinn agus tha sinn a' seòladh á t-side. Chuir mi romham a dhol ann an tilleadh-toisich. We turned back and we were sailing out of the weather. I decided to go on the foredeck. I am on the left side. The man on my right is Patrick Murphy. He worked in the deck department. If anyone has the time to break them down for me, I'm sure I mangled the verb tenses. I'm still having trouble sorting out when to use what. Tha mi toilichte gun do thill sibh slàn sàbhailte. Your tenses were mostly right, well done! Watch out for the use of personal pronouns (mi, iad etc) and of the article. You had a couple extra. Shaoil mi gum feuchamaid rudeigin ùr. beanntan, air a' Ghàidhealtachd leis na càirdean againn. Aona Latha, chaidh sinn do Ghleann Sìth. Bha sinn airson An Sochach a shreap. 'S e latha fuar sa Mhàrt a bh' ann. Cha robh e ro dhoirbh, agus ràinig sinn air muin na beinne ann an trì uairean. Nuair a choisich sinn sìos na beinne, thòisich stoirm-shneachda. Nuair a sguir i, ghabh mi an dealbh seo. ...agus typo: "Seo a' chiad fhear agam"
Tapadh leibh a GhunChleoc 's Eilidh. Dealbh eile a' tighinn a dh'aithghearr.